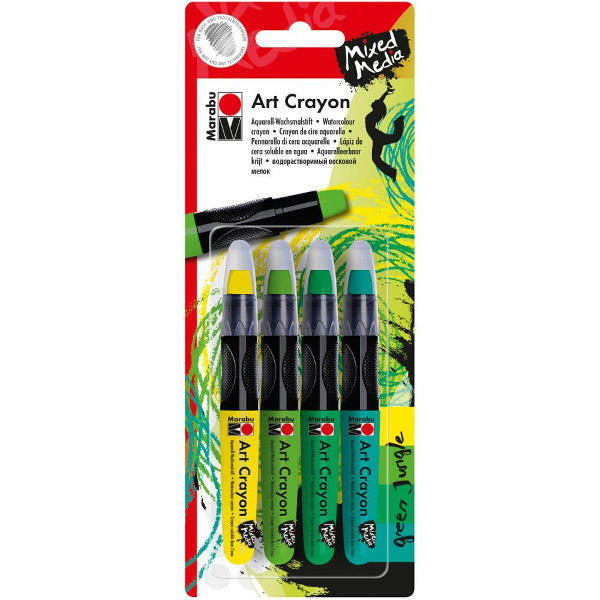 Marabu Mixed Media Art Crayons are high pigment, water soluble wax crayons with a smooth soft consistency. The vivid, lightfast colours can be smoothly mixed for brightly colored blending and a watercolor appearance when combined with water. Ideal for producing backgrounds, wipe-stenciling and stamping as well as linking mixed media projects. A buttery smooth, wax-based soft pastel in a sturdy, fully-loaded retractable holder with an ergonomic grip and a clear protective cap. A versatile medium that is suitable for a variety of fine art and mixed media work. Art crayons work well on raw or primed surfaces such as paper, fabric, canvas or wood. Create rich textural solids at 100%, blend and stamp colors for beautiful backgrounds, or brush with water for transparent effects or reductive techniques like wipe stenciling. Wipe Stenciling: Working on a semi-porous surface such as gesso, paint the area with art crayons then position the stencil and wipe around and through the stencil design with a damp cloth. The design will be a negative of the stencil.